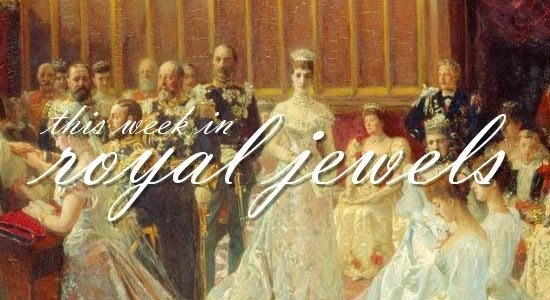 We spent last week covering the immense glitter of the annual Nobel Prize ceremonies in Stockholm, but there have been other royal jewels out and about over the past two weeks. Here are ten of my favorites -- be sure to vote for yours in the poll below! 10. Princess Charlene of Monaco wore classic pearl stud earrings to distribute Christmas gifts at the palace on Wednesday. 9. At the Dutch Rome Prize Awards on Thursday, Queen Maxima of the Netherlands wore a rather dramatic pair of drop earrings. 8. Queen Letizia of Spain chose her Tous pearl drop earrings for a meeting of the Princess of Girona Foundation on Monday. 7. Queen Sonja of Norway wore turquoise and gold jewels for the presentation of the Nobel Peace Prize in Oslo on December 10. 6. In Brussels, Queen Mathilde of the Belgians chose a big, dramatic gold leaf necklace for a gathering of royal warrant holders on December 8. 5. The Windsors gathered en masse at Buckingham Palace on Wednesday for their annual Christmas luncheon, and Lady Gabriella Windsor selected a classic pair of pearl drops for the occasion. 4. The Duchess of Cornwall also wore pearls to the Christmas luncheon, plus a diamond Prince of Wales feather brooch. 3. Princess Alexandra also attended the luncheon; she donned her square emerald and diamond stud earrings. 2. After the luncheon was over, it was time for Queen Elizabeth II to make her annual pilgrimage to Sandringham. She caught the train on Thursday wearing her aquamarine and diamond laurel brooch, a piece that's been in her collection at least since the publication of Leslie Field's book about her jewels. 1. My top spot this week goes to Queen Letizia, who offered up a bit of modern glamor on December 10 in her Yanes girandole earrings.